FREEPORT, Grand Bahama -- When Save The Bays hosts its first Grand Bahama fun-raiser, Chillin’ by the Dock of the Bay, February 28, it will link five performers who have never before performed together but are united over a cause that each is passionate about – protecting the waters of The Bahamas. Headlining the concert set for 4 pm on the waterfront at Flying Fish Seafood Restaurant is the top-selling musician Kirkland ‘KB’ Bodie. 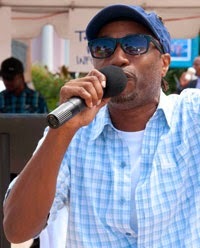 “KB rose to fame with songs like ‘Bush Mechanic’ and ‘She Fat’ but in recent years he has lent his talent to social causes, penning numbers that point to political will, transparency and accountability,” said Save The Bays CEO Lindsey McCoy. “One of his latest songs, ‘Hold dey feet to da fire’ is among the country’s biggest hits.